Cockroaches live in a wide range of environments around the world. These pest species prefer warm conditions and thus are commonly found in the buildings of densely populated cities and also in the southern United States. In fact, the Asthma and Allergy Foundation of America reports that 78 to 98 percent of urban homes have cockroaches – with as many as 900 to 330,000 cockroaches per home! Cockroaches are most active when the temperature is greater than 70 degrees Fahrenheit and they thrive in warm environments with easily accessible food and water. These insects are mainly nocturnal and will run away when exposed to light. Amazingly, some cockroaches have been known to live up to three months without food and a month without water. Cockroach allergy was first reported in 1943, when it was noted that certain patients developed skin rashes immediately after the insects crawled over their skin. Allergy skin tests were developed in 1959, which confirmed patients’ cockroach allergies. Subsequent studies have firmly established that cockroach allergens can act as a trigger for acute asthma attacks. The National Cooperative Inner-City Asthma Study (NCICAS) found that asthmatic children with both a positive skin prick test to cockroach allergen, and a high exposure to cockroach allergen in the bedroom were more likely to have wheezing, missed school days, nights without sleep, and unscheduled medical visits and hospitalizations for asthma. Approximately 23 percent to 60 percent of urban residents with asthma are sensitive to the cockroach allergens. However, the risk of asthma from cockroach allergen exposure and allergy is not limited to children. 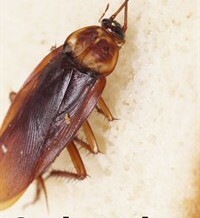 The study also found that cockroach allergy was associated with more severe asthma among elderly asthmatics in New York City. Asthma is a serious, sometimes life-threatening chronic respiratory disease. Unfortunately, it directly affects the quality of life for almost 25 million Americans, including an estimated 7 million children. Millions more are impacted as family members of persons with asthma. Although there is no cure for asthma, it can be controlled through medical treatment and management of environmental triggers – such as cockroach allergens. People can mitigate cockroach problems and protect their health through barrier exclusion and cleanliness. Barrier exclusion involves preventing cockroaches from entering the home through places, such as small cracks in the walls and spaces near electric sockets, and up through drain traps. Having a clean and sanitary home will make it less inviting to cockroaches. Keep counters, sinks, tables and floors clean and free of clutter. Clean dishes, crumbs and spills right away. Store food in airtight containers, and always avoid leaving food out (including pet food!). Seal cracks and gaps in walls, floors and openings around or inside cabinets. Condo- and apartment-dwellers should also seal gaps around plumbing, wall outlets, and switch plates. Run water periodically in spare bathrooms and little used sinks. Scan children’s backpacks when they return home, as well as grocery items before storing them.